1 in 8 women will be diagnosed with Breast Cancer. Last year (2014) more than 2.8 million women living in the United States had a history of breast cancer. About 1 in 1,000 men will develop breast cancer in their lifetime. After reading those facts it becomes clear why we need to work harder on spreading awareness and support for breast cancer. I think it is safe to say that a majority of the population has either lost someone they love or knows someone who lost a loved one to breast cancer. The pink ribbon is commonly associated with this form of cancer. So, for the month of October my blog will be devoted to sharing inspiring messages, and hope for those who are battling, overcoming or have lost loved ones to breast cancer. 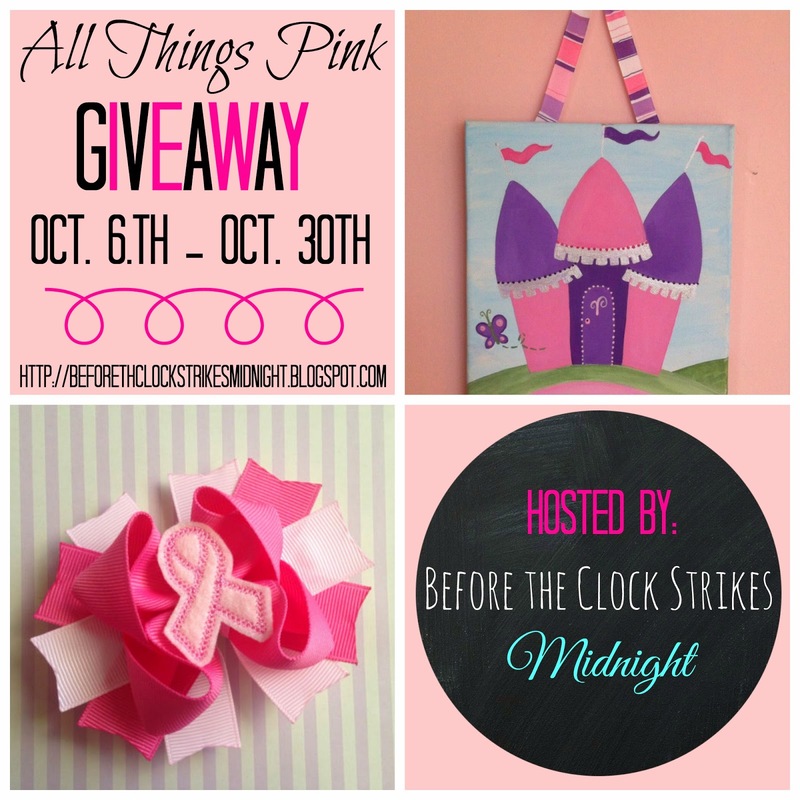 During breast cancer awareness month, I will also be hosting a month of giveaways! "All Things Pink" As reminder of the fight we want to win. I haven't lost anyone in my family to breast cancer, but I have seen friends lose their mothers. The pain and sadness that comes from losing a love one can be unbearable, but through working on spreading awareness and finding a cure true peace can be found. The best way to find yourself is in the service of others. Stay tuned for the next post about ways to get involved and support those affected by breast cancer. Terms & Conditions: The winner will receive one boutique style hair bow from Trisha's Creations and one princess castle painting from Sweet Dreams Art. Anyone wanting to enter must be over 18 years old and living in the United States. Refer to the giveaway for details on the opening and closing dates. The winner is chosen randomly and the winner will be announced two days after the giveaway closes. This is cute! Entered. Hope you come back tomorrow for the party! CONNIE SOWARDS commenting: I like the Turquoise and Purple Monogram Headband from and the Abstract art canvas painting on thick gallery wrap. I love the butterflies light switch plate at MySweetDreamsArt and my daughter loves the Bling Tuxedo Hair Bow Set from Trisha's Creations! If you would like to use my photo's/articles always link back to my blog and give proper credit.